In April 1892, William Gandell paid £1/11/6 for a book called “Electricity and Magnetism”. The book was almost 1,000 pages long, and described such inventions as the battery, the electric motor, the electric telegraph and the telephone. William Gandell was my great great uncle, and the book subsequently found its way down to me. Sadly, it did not occur to me to look in this book when I was assembling the images for DOT-DASH TO DOT.COM. Although much of the material that it contains is far too detailed to be of interest to the general reader, it does include some wonderful images that are reproduced below. 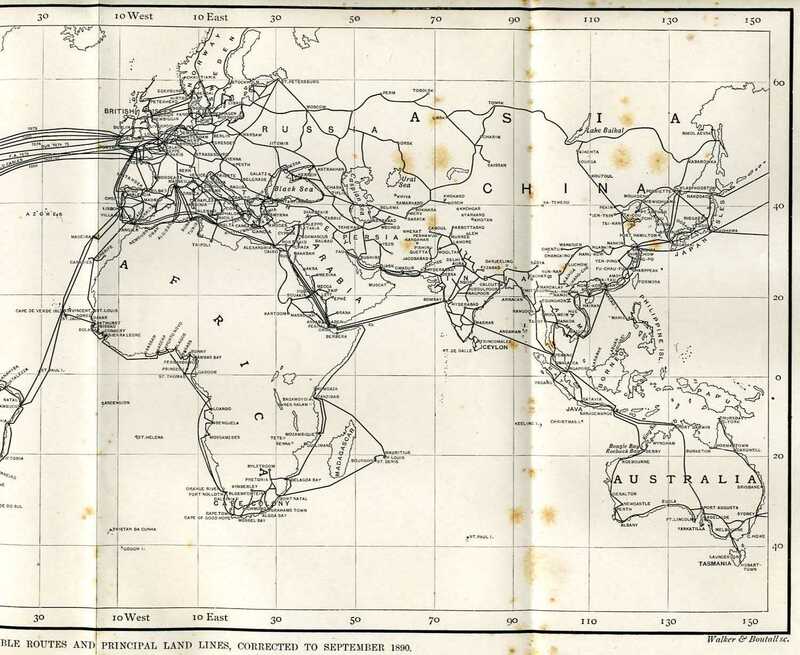 Here’s a map of cable routes, also dated 1890. 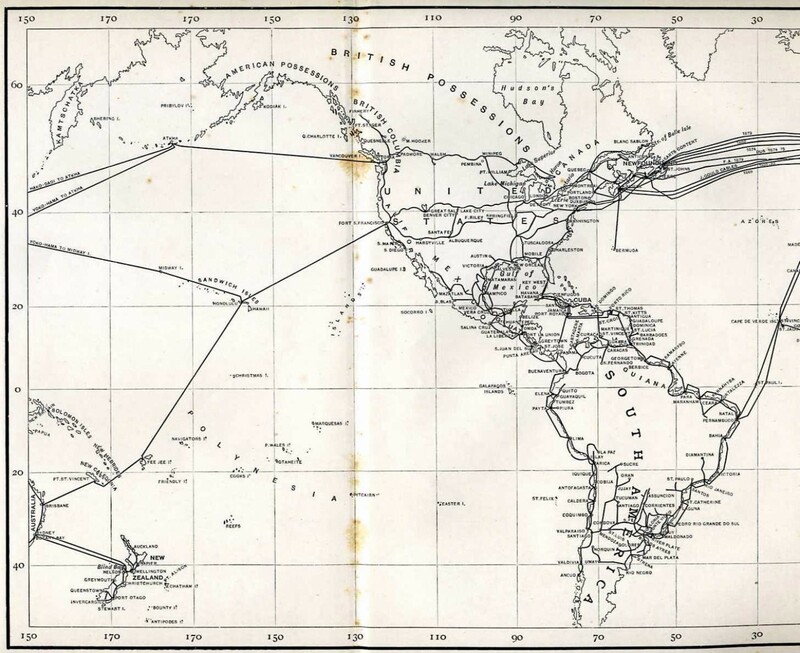 The important role that the telegraph played in managing the British empire can be clearly seen from the routes. 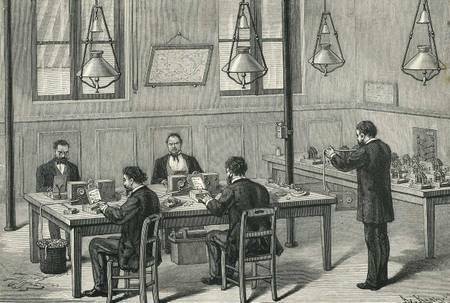 On 3rd June 1880, Alexander Graham Bell transmitted the first wireless telephone message using his newly-invented “Photophone”. The Photophone contained a flexible mirror which vibrated in response to the speaker’s voice. When sunlight was projected on to the mirror, the vibrations were superimposed upon the reflected beam. At the receiver, crystalline selenium cells were used to detect the light beam. The resistance of these cells decreased as the intensity of the light increased, thereby allowing the speech signal to modulate an electrical current. This current could then be converted back into audible speech using an ordinary telephone receiver. In effect, the Photophone was a telephone that used light instead of electricity to carry the signal from the transmitter to the receiver. Bell took out four separate patents relating to the Photophone, and it is reported that he considered it to be a more important invention than the telephone because it could operate without wires. However, his design was vulnerable to interference from rain or fog, and it could only communicate over a restricted distance. 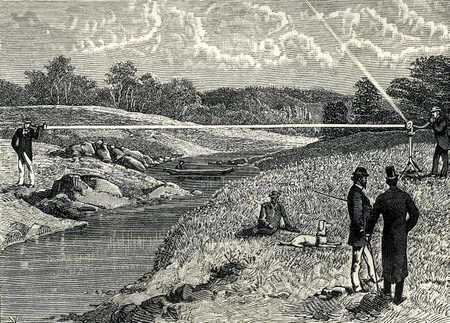 It was not until the development of fibre optics that communication using a beam of light became a practical possibility. As a footnote to this page, great great uncle Willie’s book on Electricity and Magnetism was edited by Silvanus P. Thompson, a Fellow of the Royal Society and a well-known scientist of the day. In 1910, Silvanus P. Thompson published another book called “Calculus Made Easy”, which remains the best introduction to the calculus that has ever been written. I’m delighted to note that it’s still available on amazon – complete with 5-star reviews. It’s a classic!